Fresh, healthy and delicious! If you just don’t feel like making or eating the veggie patties, swap it for grilled salmon or grilled chicken. Start by making the dressing. Using a food processor, place green onions and basil into food processor and blend until smooth. Add the remaining vinaigrette ingredients and process until smooth. Add to bowl and set aside. If you don’t have food processor, you can make the vinaigrette by hand. Finely chopped the green onions and basil and whisk all ingredients together in a bowl. Next, make the quinoa cakes. In a large mixing bowl, stir together all quinoa cake ingredients until thoroughly mixed. Place the bowl in the refrigerator for 10 minutes. Refrigeration is not necessary, but it will help keep the patties together. Over medium-high heat, preheat a large skillet with 2 tablespoons of olive oil. Using a 1/4 cup measuring cup, measure out patties into the hot pan and gently flatten to make round patties. Cook each side for 2 to 3 minutes, or until golden brown. Cook patties in batches if necessary, adding more oil as needed. 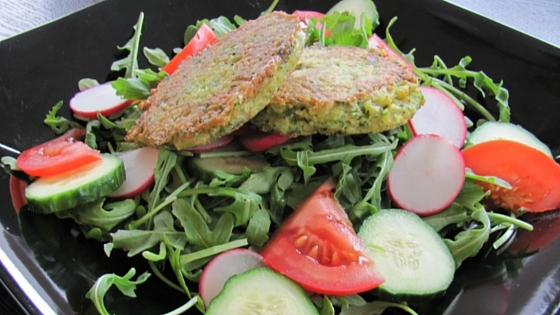 Prepare salad on individual plates, top with a couple Quinoa Cakes, and drizzle with vinaigrette.